The King's Singers give special treatment to this Andrew Lloyd Webber classic from The Phantom of the Opera! "Seasons Of Love" - Rhythmic challenges will reward more advanced a cappella ensembles in this arrangement from the Broadway hit, RENT! 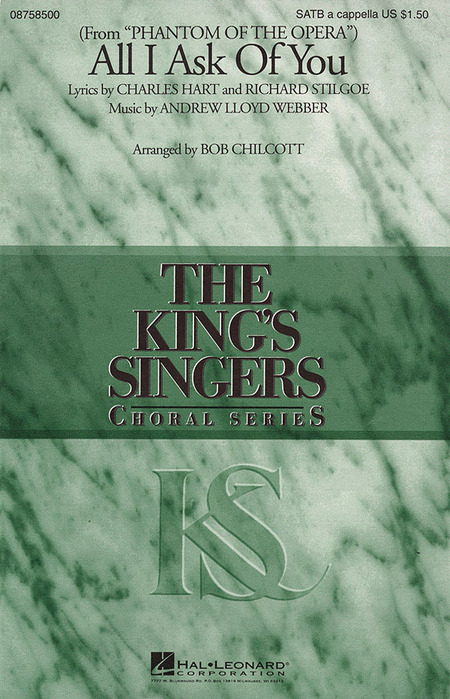 "I Have Dreamed" - Lush vocal textures and expressive harmonies are the highlight of this well-crafted a cappella setting of the classic ballad from Rodgers & Hammerstein's The King and I. An excellent showcase for both concert groups and vocal jazz ensembles. "Sun & Moon" - Here is the tender ballad from Miss Saigon in a warm and expressive a cappella setting. The imploring melody emerges from the rich vocal accompaniment like a beacon. Stunning! "AllI Ask Of You" - The King's Singers give special treatment to this Andrew Lloyd Webber classic from The Phantom of the Opera!